Many people come to Spain on holiday and consequently decide they want to live here. Mark Shurey knew he wanted to live in Spain long before he ever set foot in the country. From an early age growing up in Norwich, Mark was fascinated by the guitar and was studying classical music when, by chance, he met a group of Gypsy travelers camping on an abandoned airstrip. Mark remembers those days as idyllic, practising guitar in a beautiful orchard surrounded by caravans, horses and most importantly musicians and dancers. They taught him the complex flamenco rhythms and how to accompany the dancers and even took him with them when they travelled around Holland and Ireland performing. It was this experience that made him realise he could leave England. One day he decided to do just that. He left his job, sold his house, jumped on a boat and, carrying his guitar, hitched across country all the way to Almería. With enough money to last a year, he was determined to make the most of it. 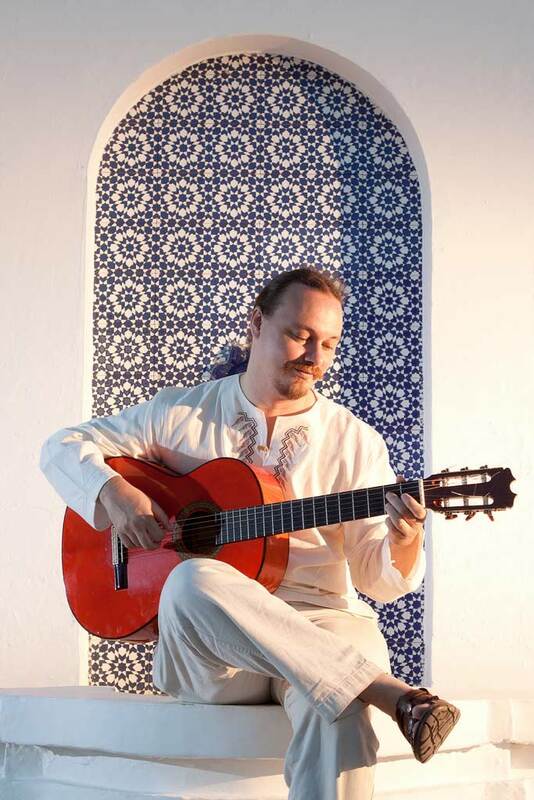 Eleven years later, he is still here and runs successful osteopath clinics in Granada and Nerja as well as being an accomplished flamenco guitarist whom the locals have nicknamed Pimientito, little pepper. However, on arriving in Andalucía he had been stunned by the flamenco guitarists he met. “I felt cheated almost. I had thought I had a high level of playing and then discovered I still had a long way to go”. 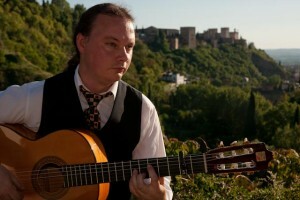 Mark chose to settle in Nerja where he found a small but thriving flamenco scene. Regular performances at the flamenco clubs meant Mark could spend his evenings accompanying rumbas, improving his Spanish and gaining acceptance amongst the flamenco players. In England he had graduated with a Diploma in Osteopathy from the European school of Osteopathy in Kent. It served him well, five years of training was followed by four years of working for the NHS and on his arrival to Nerja he found he was the only qualified Osteopath in the region. After 2 years of working from home, a place he describes as a dream house with its own beach, he established himself in professional premises in Nerja. Flamenco and osteopathy may seem worlds apart but Mark feels they have a lot in common in that both are physically demanding and require total concentration. “I really would not want to spend my entire life doing one or the other, the fact is that they are both complementary. Working during the day as an osteopath is something that I find incredibly rewarding but actually it can be quite draining as well, so flamenco works as a release for me”.